Reconnaissance unit members of the Northern Fleet's Arctic mechanised infantry brigade conduct military exercises to learn how to ride a dog sled near the Lovozero settlement, Feb. 1, 2016. The Russian military has held its first training exercise using reindeer and dog sleds to carry out patrols in the harsh conditions of the Arctic. A special program is already in place to prepare huskies for service with the armed forces. The reconnaissance brigade of Russia's Northern Fleet has begun conducting training exercises using the vehicles of indigenous peoples – reindeer and dog sleds. 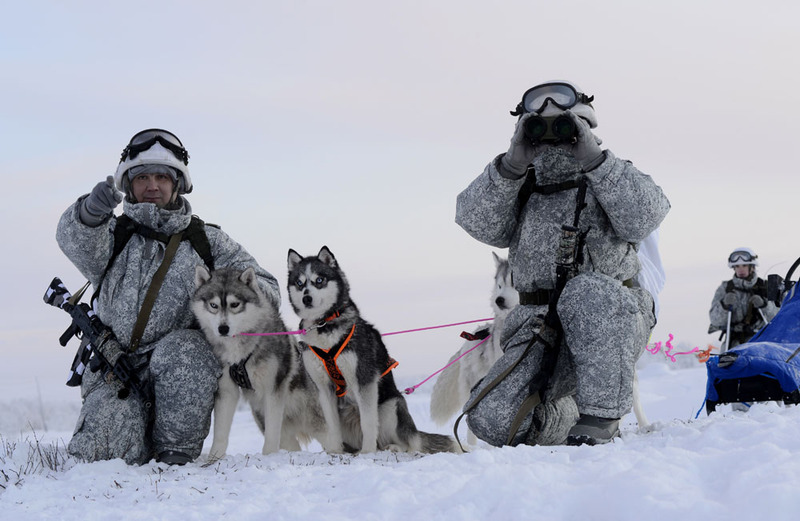 Despite severe weather, with temperatures reaching -30 C (-22 Fahrenheit), soldiers and sled dogs of the Northern Fleet reconnaissance brigade accomplished their mission, held in the Murmansk Region in the north of European Russia. During the exercise, the soldiers had to use the traditional dwellings of the nomadic peoples of the north – chumy, or raw hide tents – to keep warm. According to Vadim Serga, head of the Northern Fleet press service, experienced reindeer herders can deploy a field camp of chumy within 15 minutes. “Sled dogs are selected when they are still very young. You can tell if a husky puppy will make a good sled dog as early as 1.5 months,” Sergeant Sergei Timonin, head of the 80th Arctic motorized infantry brigade kennels, told RBTH. “If the puppy wants to be outside most of the time, if it is energetic and can't stay still indoors, it should be sent to a dog training facility,” said Timonin. Starting at the age of three months, the liveliest puppies are shown how the adults work. A young dog is sent to run beside a sled dog team, with a special counterweight attached to its back so that it will not bend its spine in a bad way. It is also important to teach the dog not to be afraid of the loud noises that are inherent to fighting. “At first, the puppies are taught to endure the sounds of a falling book, and then, gradually, we increase the loudness until we reach the sounds of assault rifle and machine gun fire. The training ends at the age of 18 months when the dogs are attached to an adult team,” said Timonin. Read more: How much does it cost to run a tank? According to the dog handler, a certain hierarchy exists within a dog team: It is headed by two leaders, a “senior” and a “bully,” who set the pace for the whole team. According to Timonin, dog sledding is one of the most convenient means of transportation in the Arctic. During military operations, dog sleds can be used to easily climb hills, as well as carry the wounded and various supplies. “And should the driver himself get wounded, his dogs will pull him to the nearest populated area. In case of an unexpected stop, the animals are taught to surround their driver in order to guard him and keep him warm,” he said. The first Arctic brigade equipped to conduct operations in the far north was created in 2015 as part of the Northern Fleet (which belongs to Russia’s “North” joint strategic command). The brigade was deployed on the basis of the 80th motorized infantry brigade stationed in Alakurtti (Murmansk Region). A second brigade is to be deployed in the country's Yamalo-Nenets Autonomous District in northern Siberia.